Home / Products / The Galamian Scale System For Violoncello (Volume 1) (Scale and Arpeggio Exercises). 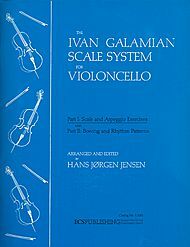 The Galamian Scale System For Violoncello (Volume 1) (Scale and Arpeggio Exercises). By Ivan Galamian. Edited by Hans Jorgen Jensen. For cello, cello. Instructional and Scales. Instructional book.